Last Saturday: No tourists here, just cherry trees among the bungalows and four-squares of this neighborhood that a friend calls, “Our Urban Mayberry.” A child rolls by on a scooter, pushing along with one leg. Dogs briskly walk their owners. 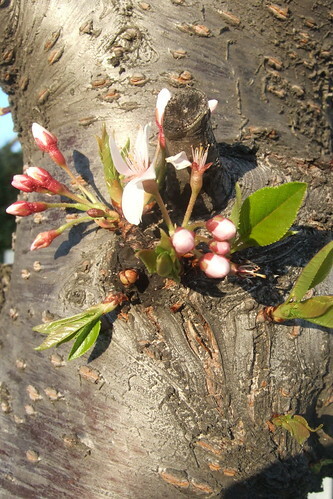 At one corner I pass yet another Somei Yoshino (Yoshino Cherry) with the classic five petals and white/pink color. I fondle its bark. I pass a few Bradford Pear Trees with their flat white blossoms. 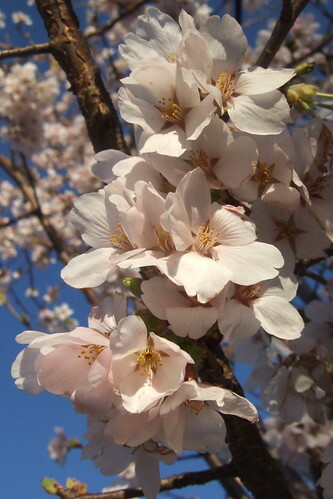 Nothing to compare with the cherry blossoms, or my beloved plum blossoms, Prunus mume. Ah! 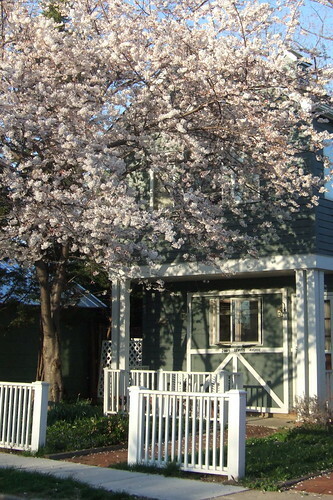 A tiny yard offers a Shidarezakura (Weeping Cherry), the drooping branches making a fountain of blossoms. Already late, the blossoms are fading. I stroll about after work feeling the passing of time. I wish for Japan. I miss my friends who I know are sitting on blankets, drinking sake, perhaps singing as they gaze up at the billows of flowers. 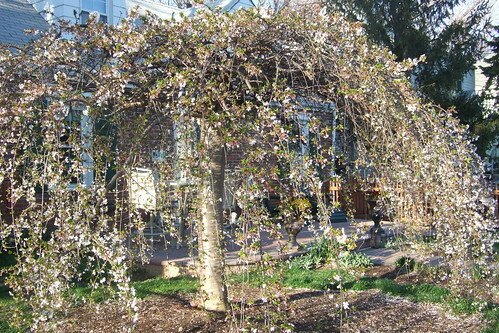 But these blossoms remind me to take in the moment. Nostalgia is wasteful when there are flowers in the trees. Peace and contentment to you, madam. I miss Japan, too. 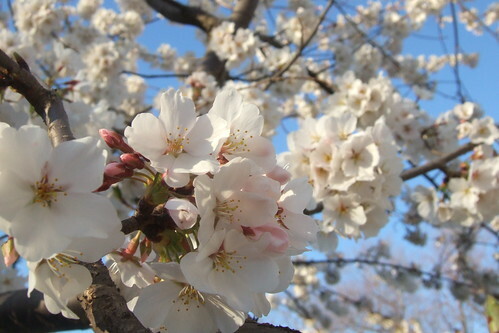 So our sakura time are almost in sync. Or we are a few days behind? I hope you grab your bottle of sake and enjoy private hamami time. Beautiful! Madam says: Mr. Google tells me Tokyo is a few days behind Washington, DC. Kampai! Cherry blossoms without hordes? Does not compute. Love your site. Madam says: Welcome, and thanks.